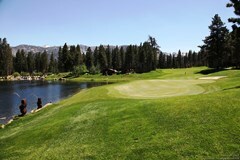 Mammoth Lakes offers a wide variety of golfing treasures in town and the surrounding communities. All are open to the public. And for those who don't mind a short drive for golfing year-round, you might want to try the Bishop Country Club (760-873-5828) or the Mt. Whitney Golf Course in Lone Pine (760-876-5795, semi-private). Need help in booking your tee times? Just notify one of our friendly agents when making your Online Reservation. They will be happy to assist you.